Solano Avenue is the principal street in historic Solano Canyon. 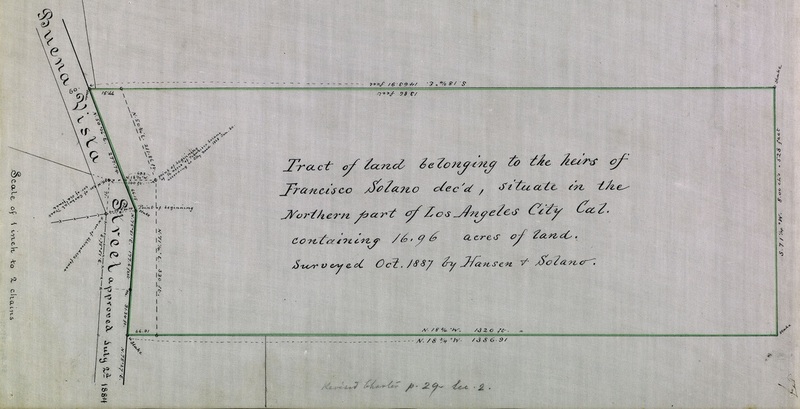 Along with Casanova Street, Solano Avenue is an original street, dating from Alfredo Solano's 1888 survey of his father, Francisco Solano's original purchase of 16.96 acres from the City in 1866. Solano Avenue was created on May 2, 1888, and was described as running "NW of Buena Vista Street." (Buena Vista Street was renamed North Broadway in 1909). On this map, the 16.96-acre tract has been subdivided into 100 lots. The 60-foot-wide street near the top is Solano Avenue. The thin, blue line running the length of the property (the image is rotated 90º clockwise) is a stream that flowed from a spring higher up in the ravine. The spring is now dry. Notice that the tract is surrounded on three sides by Elysian Park. When Alfred Solano subdivided Solano Tract No. 2, Solano Avenue and Casanova Street were extended into the new tract. Other streets were added: Bouett Street, Amador Street, Brooks Way, and Jarvis Street. The origin of the names of all of the new streets is straightforward except for Amador Street, whose origin remains a bit of a mystery.